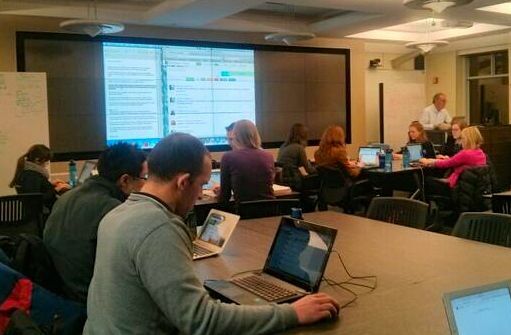 Learning & Organizational Change graduate students in the thick of a class sponsored Twitter chat. On Thursday, Feb. 27, my class of graduate students from the Master of Science in Learning & Organizational Change program at Northwestern University organized a Twitter chat to explore the following: What tactics have proved effective in seeding the adoption of social collaboration technology, considering the variety of organizational and work contexts out there? The intent was to pursue something more than generalized “best practices” – which are often a fiction, or which have been filtered to such a watery form as to become almost meaningless (i.e., “engage leadership support”). The class was trying to get closer to tactics and strategies that have more flavor, that get closer to the tacit know-how of practitioners who have lived through the process of social technology adoption and have come out with some success. What roles (formal or informal) are important in seeding adoption? Are there specific activities that users could be nudged to do – that start the momentum? What are the trade-offs of “going big” vs. focusing on energetic early adopters? The Twitter chat was an explicit effort to “thin the walls” of the classroom (to borrow a phrase from my ed tech network) – make them a bit more permeable by connecting students and practitioners directly, using common social media tools like Twitter. The result was a wide-ranging give-and-take with almost 40 participants (13 in the class). A cohort of experts from Change Agents Worldwide joined in, as did a number of practitioners and thought leaders from our close and extended network. The discussion covered many angles in answering these questions. Participants also shared links to a variety of great resources and thought leadership – all of which is recapped in the Storify of the event. I’ve tried to synthesize some of the themes and interesting points below. But the full transcript is a gift that goes far beyond my recap. Roles. Community manager roles (for “lift off”), champions, savvy social network tool users, and the support of leadership roles (for funding if nothing else) were noted. But more interesting were the informal “momentum builder” roles that emerge from people who are willing to experiment – the first followers. The tweet from Bryce Williams drew an immediate reaction and, for me, pointed to a theme about the traits required in both the formal and informal roles: Part rebel, part trusted peer. Someone with social skills that bridge the online environment and the context of the workplace in which they are embedded. The Harold Jarche “let dinosaurs die a natural death” comment also drew commentary. I’ve heard this kind of thinking in the context of enterprise social networking from others as well – and have probably said it in class a few times. The more I reflect on it, the more I sense the push-back when people hear this is rooted in the knee-jerk approach to implementing change – i.e., that we control it from the top down or some central point outward and we must cascade our communications, activities etc. to make sure all are “changed.” That’s a delusion at best. Of course it is keenly important to pay attention to the edges – who lives at the margins, that we should be engaging? – but that’s a different issue than trying to convert the nonconvertible. Activities. Much of the dialogue was around simple nudges. Get people to ask questions. And others to answer. Solve simple problems. Fill out profiles and share photos. Make the initial engagement authentic – rather than trying to force interaction. There was also a good bit of dialogue around the theme of “lurkers’ being a positive role. “Lurking” – or just reading in an online community without responding – is actually seen as a very engaged activity; it is the heart of online social learning. “Go big” vs. focus on energetic adopters. I commented during the chat that it seemed to be a blowout – no one thought “going big” was a good idea. But upon reading the full chat again, there are some nuances to the issue. You certainly have to think big. Or it may be a matter of timing – when to go big vs. “if.” But the chat did bring up a wide range of downsides that make going-big either wrong-headed at worst or risky at best. In the end, the chat clearly pointed to the challenges of “implementing” – which all of its top-down, hierarchical implications – a change in work patterns and technology use that deliver value by being emergent and organic. Like all of the practitioners who participated in the chat, the key seems to be in understanding emergence and embracing it. Let the lurkers lurk. And the dinosaurs drift into history. Aditya Singh Chauhan – Engagement Space: What drives engagement on Social Networking platforms? Thanks to Aditya, as well, for the photo in this post. Great post Jeff, I’m sorry I missed this chat – had it in mind then forgot (I think it was early morning here…). Thanks for your recap though and Storify – look forward to checking that out. I was interested to hear that your impressions of the ‘going big’ changed when you were able to sit down and digest and reflect on the nuances of the chat transcript later. This is often the difficult thing about twitter chats – there’s so much going on during them that it can be challenging – almost impossible sometimes – to gauge nuances in the arguments. I storified a tweet chat for the first time recently and came to this realisation. It was quite interesting also reflecting on the non-linear nature of twitter chats – and how – to get it into a comprehensible format – (e.g. via Storify) you actually need to construct a linear narrative. Anyway – going a bit OT…back to your chat – it’s interesting from this wrap up, to see how the view on ESN ‘implementation’ is maturing, with the move away from ‘going big’ (i.e. aiming to get everyone ‘ON’) to testing the waters, seeding adoption and evolving a culture of social sharing. Much more realistic view of how change actually occurs within organisations of diverse individuals. Thanks Tanya. I always value your insights and thoughts. And your consistent presence! Funny…I do think the process of Storifying a Twitter chat changes the whole experience. Not only slows down the stream, but forces you to make sense of it. More to come. See you around, yes?